by the inventor of dynamic Interferential Therapy, Dr. A. Hansjurgens. Imported to USA since 1994. Hako-Med featured in German equestrian magazine, Cavallo. Hako-Med's PRO ElecDT 2000 featured in Medical Economics. Hako-Med will vigorously pursue and prosecute to the fullest extent permitted by law any person or entity who has and or is infringing on Hako-Med's intellectual property, who aids or has aided in infringing on Hako-Med's intellectual property, who sells or has sold Hako-Med’s intellectual property without Hako-Med’s express permission or who knowingly buys or has bought or who knowingly possesses Hako-Med's intellectual property without the express permission of Hako-Med. Dr. Nevada Lee, M.D. 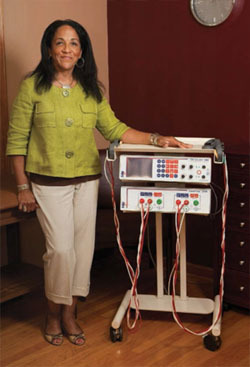 is featured in the cover article discussing how her practice utilizes a Hako-Med PRO ElecDT 2000 system to "really make (my) patients feel better." Using existing Medicare reimbursements the Horizontal Therapy system "helped us survive the first two years" of my practice. Patients benefit from Hako-Med's immediate positive treatment effects. In many cases allowing patients to reduce or discontinue pain medications with dangerous side effects. Physicians benefit by growing their practice and their bottom line without using any additional capital or resources all while increasing the level of care for their patients. Insurance carriers benefit financially from the long lasting (curative effects) of Hako-Med's patented Horizontal Therapy. The answer to pain from osteoarthritis is here; Horizontal Therapy. Patented technology that relieves over 80% of your patients with pain from osteoarthritis. This safe, effective, and easy to use modality is available to your practice now with no out-of-pocket expense. Being non-invasive and having no negative side effects when used correctly this revolutionary treatment enables you to expand and retain your patient base. With virtually all insurance carriers covering this treatment you can start helping your patients and your bottom line today. In 2002 I bought my Hako-Med Horizontal Therapy equipment. The results with my patients have been outstanding. As a Rheumatologist, I see a lot of patients with pain in multiple areas. It improves the patients significantly. My patients are happy to have a drug-free option for pain control and some who were told that they needed orthopedic surgery (such as for ankle fusion, knee arthroscopy, as well as rotator cuff) are now active and pain-free or relatively pain-free. The Hako-Med PRO ElecDT 2000 has also done wonders for some of my neuropathy patients as well. It was an excellent investment both for my patients and my practice. I purchased my Hako-Med machine in October 2004 and I have treated approximately 150 patients in the past 16 months. The Hako-Med Horizontal Therapy has provided my patients the convenience of having therapy while they are in the clinic for their appointments rather than going to a physical therapy place separately. The Hako-Med system is very useful for my patients who do not like taking medications for their arthritis as they are paranoid about the side-effects of the medicines especially since Vioxx and Bextra got pulled out of the market. The Hako-Med system has provided patient satisfaction as well as well documented researched-proven results. The Hako-Med system has been the perfect solution for my patients. In 2003 we purchased our Hako-Med unit. Since then our unit has been very beneficial to our office. Our unit has assisted with both pre & post surgical patients. In many cases our patients have opted to not have surgery after experiencing what the Hako-Med has to offer. Post Surgical patients have quickly re-gained range of motion and experienced a great decrease in pain.